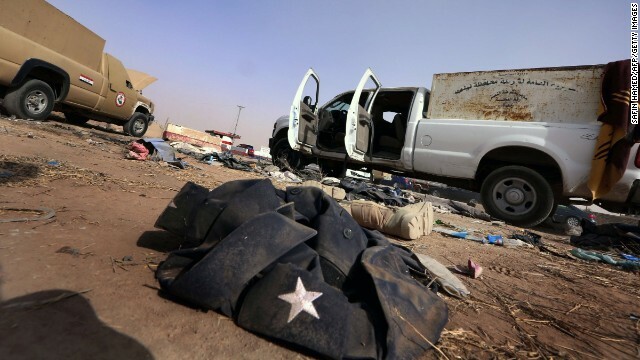 CNN speaks with Fareed Zakaria about the advances made by militant group Islamic State of Iraq and Syria over the past week, what role the United States can play in assisting Iraq's government, and whether the latest violence was inevitable. This is an edited version of the transcript. I think that what the president is trying to do is to force the Iraqis, particularly Prime Minister Nuri al-Maliki, to make some political overtures to the Sunnis. Because I think he recognizes at the heart of this problem what you have is a disaffected population – about 20 percent of Iraq that is fueling and supporting the insurgency. Remember, the problem is not arms or men. The Iraqi army is about three-quarters of a million men strong. They have been trained in equipment supplied by the United States for ten years. The insurgents are about 2,000 or 3,000 people. So the fact that the insurgents [are] taking this down tells you that the basic problem is not a military one, it’s a political one. The army won't fight. The Sunnis in the area are providing support for the insurgency. Explain the interest of Saudi Arabia in this conflict. Saudi Arabia has been fueling the Sunni opposition, both to the Iraqi government but also to the government in Syria. So the Saudis have in a sense been at the heart of what one could call "a Sunni revolt." The Sunnis, remember, are a minority in Iraq, but they're a majority in the region. And the principle Sunni power is really Saudi Arabia. It used to be Egypt, but now, with Egypt in turmoil and Saudi Arabia rich, it’s Saudi Arabia. And the Saudis have, generally speaking, supported Sunni groups that are pretty nasty, quite violent, quite radical. They have backed off of some of the most extreme versions. Remember, they famously supported what were the precursors to al Qaeda in the 1980s when they were battling the Soviet Union. So the Saudis have always been part of the mix here, and in many ways, what you're witnessing is a Saudi versus Iran war that is being fought by these proxy groups, so that the Iranians fund certain governments and certain groups on the one side, and the Saudis fund other groups on the other side. That piece of it is actually quite simple and strategic. It's Shia versus Sunni. It's Arab versus Persian. The part that's complex is that we're sort of in the middle in a somewhat incoherent way, so that when ISIS is battling the al-Assad regime in Syria, we sort of think at least they're battling our enemy. When ISIS crosses a nonexistent border from Syria to Iraq and battles the government of Iraq, now they're our mortal enemies. So we've got a problem here that's not just about the tactical issue. There's a strategic incoherence. Is this a surprise something like this would happen, or is there a bubbling of problems that sent a signal this is inevitable, this kind of scenario? It was inevitable in the sense it was predictable because we’ve seen this movie before. This is exactly what happened in '04, '05, and '06 when the Shia government in Iraq essentially started persecuting the Sunnis, purging them from office, disempowering them in various ways, and the Sunnis started fueling and funding insurgency. That's what created the civil war in Iraq. And the solution to it was General Petraeus coming in – a very important set of military moves, but also political outreach, crucially, political outreach to the Sunni community. The problem of the last three years is Prime Minister al-Maliki undid all that good work. He stopped paying off the Sunni tribes, stopped providing patronage to the Sunni groups. He started persecuting Sunni politicians, jailing them, in many cases killing them through death squads and all kinds of mechanisms. So you're back in exactly the same problem – disaffected minority, moves to insurgency, al Qaeda moves in, and they tacitly support al Qaeda. The solution is General Petraeus’ solution. They have to show some military strength, but they have to do political outreach. So it sounds like al-Maliki was simply the wrong choice, the wrong leader. Or was there a feeling that he was going to be able to appeal to Sunnis, and somehow in your view he turned on the Sunnis along the way? In my opinion, he was the wrong man always. I met with him before he was prime minister. I wrote a column in The Washington Post at the time saying this guy is a Shiite thug, hard line, shows no signs of compromise…I think that you have to look at these parties, these Shia religious parties. They are hard line religious parties that were funded by Iran for 20 years, and they're showing their true colors. The United States in a sense picked a side in a very complicated sectarian society, and we’re reaping the consequences. And there is a danger for this administration or any administration to taking sides in this case. Is this what is in large part keeping the White House or the U.S. military from engaging, making a commitment to engage again, because the U.S. would be picking sides? Absolutely. If the United States were to go in full-bore and provide support to Prime Minister al-Maliki, what it would be doing is acting as the air force for a very sectarian, very oppressive, ruthless regime in Baghdad, which by the way is allied with Iran. So how does this end in your view? What is the next chapter? Unless the Iraqi government makes major political overtures to the vicinities, I think what you are going to see is the de facto partition of Iraq. The Kurds will keep their northern part, which is Kurdistan, the Shia will keep the southern part, which is all "Shiastan" if you will. And in the middle, there will be a bad land, which will encompass not just Iraq but Syria. It will be badlands ruled by a variety of crazy radical Sunni groups, very messy, very chaotic. And a place where nobody should go and travel. I think at that point the United States' best strategy would be to try to give security and support to the stable parts of the region and just accept that there are going to be some places that are essentially badlands.